Pegasus Products Inc., has been successfully manufacturing swimming pool liners since 1982. We are a family run business out of Branchburg, New Jersey and pride ourselves on quality manufacturing, products, and exceptional customer service. Please take the time to review our website; we carry a very attractive line of patterns for inground and above ground pools. Our high standards have helped us create a loyal customer base nationwide, and we look forward to making you a customer in the future. All our products are made in the USA at our state of the art manufacturing facility. 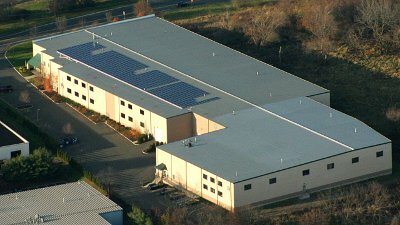 In November 2009 we completed the installation of 442 solar panels on the roof of our factory. With the sun shining, we can produce 101 kW of pollution-free energy – enough to power our entire factory while keeping 175,902 lbs. of carbon dioxide (CO2) out of the atmosphere every year. Copyright © 2019 Pegasus Products. All rights reserved. Website by New Frontier.